Paul Wilkins is a 2nd Degree Black Belt in Ed Parkers American Kenpo Karate. He began his training in Martial Arts in 1981 studying Kenpo Karate with Professor Gary Ellis (who was then a 1st Degree Black Belt). In 1982 he met Senior Grand Master Ed Parker at a seminar in Plymouth and again several years later at the European Championships held in Jersey which he participated in as part of the England team. 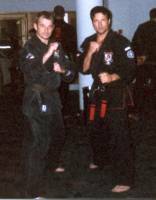 After a break away of several years he rejoined the Kenpo family and Mr. Ellis in 1999. Mr Wilkins was tested and promoted to 1st Degree Black Belt on 14th December 2002 by Professor Gary Ellis and Mr. Mark Richards. Over the years Mr Wilkins has trained and participated in International and Friendship Camps both here and abroad. In February 2004 Mr Wilkins joined his family as an instructor in Wilkins Self Defence (A Family Run Academy). December 2007 Mr Paul Wilkins was tested and promoted to 2nd Degree Black Belt. 2008 Mr. Paul Wilkins is featured in the Kenpo Continuum book written by Amy Long of Sacramento Kenpo Karate. Mr Wilkins was an official residential child care worker, and has experience of working with children who have behavioral problems. 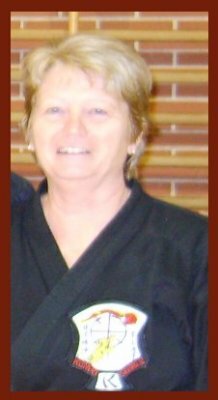 Mrs. Wilkins began her martial arts training in Kenpo during 1981 at the Tothill Community Centre under instructor Professor Gary Ellis who was then a 1st Degree Black Belt. She was passed to orange belt at Marjons in 1982 by the then European Director for the IKKA Raine Shulte and then had a break away from Kenpo training for 18 years. Although not actually training herself she remained in and around the art largely due to her husband Mr. Mark Wilkins who had returned to Professor Gary Ellis in 1993. In the past Mrs. Wilkins has taken part in International seminars both here and abroad. It was on 3rd November 1999 Mrs Wilkins returned to Kenpo training when her husband opened his first Academy in Saltash Cornwall. In October 2000 she was also a member of Professor Gary Ellis’ team in the administration department at the International Camp held at the Pavilions in Plymouth and subsequently all of the Friendship Camps since. In May 2002 she accompanied her husband Mr. Mark Wilkins as part of Professor Ellis team to the Viking Camp in Norkopping Sweden. Mrs. Wilkins was tested and promoted to 3rd Brown Belt on 14th December 2002 by Professor Gary Ellis and Mr. Mark Richards the first female to reach this level in many years. 2012 Mrs. Wilkins is featured in The Kenpo Continuum Book II written by Amy Long of Sacramento Kenpo Karate. Today Mrs. Wilkins continues to study Kenpo with her husband Mark, Brother-in-law Paul and Sister-in-law Diane. As a member of the Wilkins Self Defence team she teaches at both Saltash and Bere Ferrers Academies. Mrs Clark started Martial arts training in Kenpo in 1999, during October 2000 she helped with the Administrative side of the European Championships England, Mrs Clark has met many Kenpo students and instructors from all over the world. In 2002 she attended a seminar at the Friendship Camp held in Plymouth. December 2002 Mrs Clark graded under Professor Gary Ellis and gained her Purple Belt. She was further tested in December 2003 under Professor Gary Ellis and Professor Mark Richards and gained her blue belt. October 2007 Mrs Clark took part in Seminars, at the LTKKA World Championships held in Madrid Spain. 2012 Mrs Clark is featured in The Kenpo Continuum II book written by Amy Long of Sacramento Kenpo Karate. During 2005 Wilkins Self Defence introduced the Ed Parker Memorial Shield, Celebrating 50 years of Kenpo and in remembrance of our Senior Grand Master Edmund K Parker. Mrs Clark Sponsors a smaller version of the shield and Kenpo Kids Medals. Each year the shield is awarded to an individual child who has shown good behaviour inside and outside the training hall, respect for others including Instructors, students and family, discipline, personal endeavour, punctuality and a keen interest in Kenpo. I have always been interested in Martial Arts but never found the right one that appealed to me. I tried karate when I was young but it didn’t seem the right time, then I tried Taekwondo in my early 20’s. I did enjoy the exercise but knew I wanted something more out of martial arts. I work in the Care Industry, while at work there I met a work colleague called Paul Wilkins. Other staff told me he did Kenpo Karate. At the time I was quick to judge. Paul was a different generation to me and I used to call him granddad, which he would respond to with a cheeky grin. One day I decided to grab him unawares and said “what you gonna do granddad?” To which he threw me on the floor, and then asked if I would like to come to a class and see what it was all about? When I turned up for my first lesson I realised you shouldn’t judge people at first sight, there were people all different shapes, sizes and ages and they all had their unique way, above all it was a friendly atmosphere, as I was asked and not told what to do. I was put through some basics i.e. stepping through, it felt weird but cool at the same time, while I was learning my left from my right I looked down the hall and saw Paul and his brother Mark doing some crazy cool flower stuff which was Kenpo and I knew then I wanted to be doing that. I started around 2004 to present day. Over that time, I have been put through my paces and kept very interested in the Art and the positive people around me. I had time out travelling, and still kept up with my training on many beaches. I got my black belt on June 9th 2011 and I realise that I have so much to learn. My journey continues……..